I3 He brings forth a vast, great mind. J1 First he vows to repay kindness. as there are sand grains in the Ganges. To repay the kindness shown me by the Buddha. I wish now to achieve the result and become an honored king. Who is the “Honored King?” The Honored King is the Buddha. What is the “result?” The result is Buddhahood. He wishes to become a Buddha who then returns to save as many beings as there are sand grains in the Ganges. These two lines contain the four vast vows. I vow to study them all. I vow to accomplish it. I vow to take them across. I vow to cut them off. If you are to save living beings, you first have to cut off your afflictions. If you don’t cut off your afflictions, then you not only fail to take living beings across, but you are taken across by them. Why? Each living being has its own nature - each is different. Some are stubborn. You say something to them and they are extremely obstinate. No matter what Dharma you speak for them, they don’t listen. Basically, you should be able to take them across, but they don’t listen to your teaching; and at that time, you will give rise to affliction, if you haven’t already cut off afflictions. “Oh, you’re obstinate? Well, I’ll be even more obstinate than you!” When afflictions arise, you cannot teach and transform living beings. That’s what’s meant by being taken across by living beings instead of taking them across. If you want to take living beings across, you have to cut off the afflictions. You have to look upon living beings as children. You should not blame living beings with evil natures for being the way they are. And, of course, you should gather in and receive all living beings who have good natures. When you teach, you definitely have to cut off your afflictions. So, first you wish to obtain the fruition of Buddhahood and accomplish the Buddha’s way, and then you wish to return and save all beings. I offer this deep thought to those who are as countless as the motes of dust of the Buddhalands. I now offer my deep mind, not a shallow mind, but a mind which brings forth the resolve of a Bodhisattva of the great vehicle, to the Buddhas and to living beings as numerous as the motes of dust in the Buddhalands. I offer my deep mind to living beings so that their wishes can be fulfilled and all that they seek can be obtained. I don’t make offerings only to Buddhas, and not to living beings, because living beings are simply Buddhas. That’s just like a certain person who says, “We are all Buddhas!” Right, you’re a Buddha, but you have to cultivate before you become a Buddha. If you don’t cultivate, but just keep saying from morning to night, “I’m a Buddha, I’m a Buddha, I’m a Buddha,” it is of no use at all. You have to have true skill for it to count. ”I offer up this deep thought to those who are countless as the motes of dust of the Buddhalands” in order to repay the kindness shown me by the Buddha. 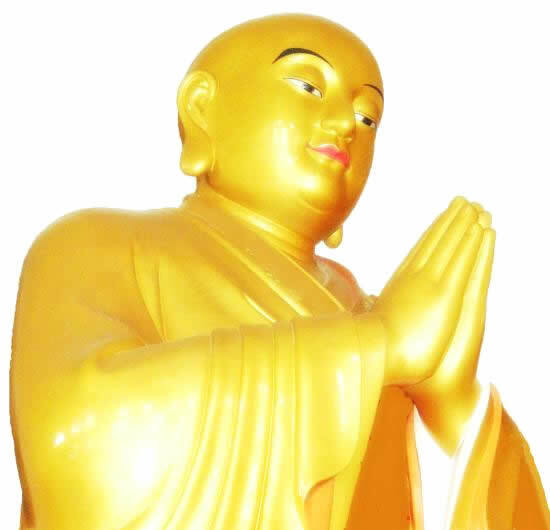 This is my opportunity to repay the Buddha’s kindness, and to show that I am grateful to the Buddha. J2 He resolves to save living beings. my vow to first enter the five turbid evil realms. Buddha, at death I will not reach for nirvana. Obeisance means placing the five limbs on the ground in prostration. I ask - he requests - the World Honored One to certify me. He wanted to offer his deep thought to beings as countless as the motes of dust in the Buddhalands in order to repay the Buddha’s kindness. But, if he had merely said it himself and no one had acted as certifier, it wouldn’t have counted. Someone definitely had to certify him. Therefore, he asked the Buddha to be his certifier, so that in the future he would certainly be able to carry out his intention. He wanted the Buddha to certify his vow to first enter the five turbid evil realms. When the human life span reaches 200,000. “When will that happen?” you ask incredulously. If you don’t believe there can be a time when people live to be 200,000, you should walk into the time when there is a lifespan of 200,000 years and take a look. Then you’ll know for sure that there are people who live to be 200,000 years old. When the time comes that people have 200,000 year life spans, the human life span begins to decrease by one year every hundred years, and the average body height decreases by one inch every hundred years. When the life span has decreased to a length of 200 years, that is the beginning of the period of the five turbid evil realms. Before the defiled and unclean time of the five turbidities, the world is very pure, just as Wu Tai mountain is now called the “clean, cool world.” In the future the world will continue to change, and after several thousand years, Wu Tai mountain may not be called clean and cool, it may be called the hot, noisy world – it’s not for sure. What are the five turbidities? The first is the turbidity of the kalpa. “Kalpa” is a Sanskrit word that is interpreted as a “division of time.” How does the kalpa become turbid? At the time of the five turbid evil realms, the evil karma of living beings makes the kalpa turbid. The second turbidity is views. In the past, people saw everything as clean. But when the turbid kalpa arrives, people see things as unclean. The turbidity of views is composed of the five quick servants: a view of the body, prejudiced views, views of prohibitions, views of views, and deviant views. The view of a body: all living beings are attached to having bodies. They love their bodies. “I certainly have to take care of myself. I can’t let anything happen to me.” They look upon their own bodies as extremely important. They want to wear good clothes, eat good food, live in a good place. They always look upon their bodies as priceless gems. Right, your body is a priceless gem, but if you misuse it, your priceless gem turns into something not even as good as excrement. Why? Because you tend only to its superficial aspects, and don’t discover the true gem of your self nature. So all you know is that your body is yours and you can’t put it down. From morning to night you are busy on behalf of your body. That’s the view of a body. Prejudiced views favor one side or the other. If you don’t favor emptiness, then you favor existence. In general, it means not being in accord with the Middle Way. The third “quick servant” is the view of prohibitions. Precepts can turn into something bad when they are based on mistaking for a cause something that is not a cause. Such a mistake leads to the cultivation of non-beneficial ascetic practices. I explained earlier how some people imitate the habits of cows or dogs, or sleep on beds of nails, or undertake other non-beneficial ascetic practices. People who do this have a view of prohibitions. “See me!” they think, “I hold precepts. None of you can do what I do; you can’t compare to me.” They always have this arrogance in their minds. The fourth is the “view of views,” or grasping at views. This is to mistake for an effect something that is not an effect. People with this problem think they have obtained effects which they have not obtained. The fifth is deviant views. People with deviant knowledge and views are always thinking about things in an improper way. These are the five quick servants, which comprise the turbidity of views. The third turbidity is the turbidity of afflictions, which is composed of the five slow servants: greed, hatred, stupidity, pride, and doubt. “Greed” refers to an insatiable greed for pleasant experiences. You are greedy for the things you like. “Hatred” is the dislike of unpleasant situations. “Stupidity” means stupid false thoughts. “Pride” refers to arrogance and self satisfaction - the feeling that “I am the greatest” and “no one is equal to me.” Arrogant people have no courtesy toward others. "Doubt” refers to doubt of the genuine dharma and a preference for improper dharmas instead. Such people doubt the true and rely on the false. They doubt the proper dharma and believe deviant dharmas. These are the five slow servants, which comprise the third turbidity, that of afflictions. The existence of these five dull servants creates a lot of affliction. The fourth turbidity is that of living beings. Living beings – let’s not even try to express it. Why? Living beings are just too filthy, too unclean, too impure. You shouldn’t think of yourself as being so terrific. Living beings are murky and turbid; there’s nothing so good about them. But living beings think of themselves as something really special, despite the fact that they comprise the fourth kind of turbidity. The fifth turbidity is the turbidity of a lifespan. Our mundane lives, our destinies, are impure. Ananda vows to first enter the five turbid evil realms to teach and transform living beings. Shakyamuni Buddha went into the five turbid evil realms to teach and transform living beings, and his disciple, Ananda, probably wanted to emulate his teacher’s great, awesome energy and do the same. He was not afraid that the five turbid evil realms were defiling, and he came anyway to teach living beings. I vow not to become a Buddha. Earth Treasury Bodhisattva is in the hells with the hungry ghosts. He says that as long as the hells aren’t empty, he won’t become a Buddha. He will definitely wait. When will the hells be empty? Don’t worry about him. They’ll be empty when they’re empty. Before they are empty, no matter how much you worry, Earth Treasury Bodhisattva won’t become a Buddha. He will wait. J3 He seeks to cast out his subtle doubts. May the exalted hero’s awesome strength, his kindness and compassion. The great hall, the main Buddha hall, is called the “Jeweled Hall of the Great Heroes.” A great hero can break all living beings’ subtle delusions, confusion, and ignorance. The great hero can break up living beings’ fundamental ignorance, severing it at its origin. With “awesome strength,” the great hero can pull all living beings out of affliction, which originates in ignorance. Great kindness toward those with whom one has no conditions. Great compassion toward those who are of the same substance. Bodhisattvas take across those with whom they have conditions. Buddhas have the compassion to save those with whom they have no conditions. Bodhisattvas say, “I’ll rescue all those who have affinities with me.” They are selective. Buddhas are not selective; they save all living beings, whether they have conditions with them or not. The fewer affinities they have, the more they want to save them. Why? If they don’t rescue those without affinities, they will never gain affinities with them. Affinities come into being from one’s wanting to establish them. So Buddhas have the great compassion which includes those without affinities. They save all living beings. J4 He resolves to quickly accomplish proper enlightenment. worlds of the ten directions. 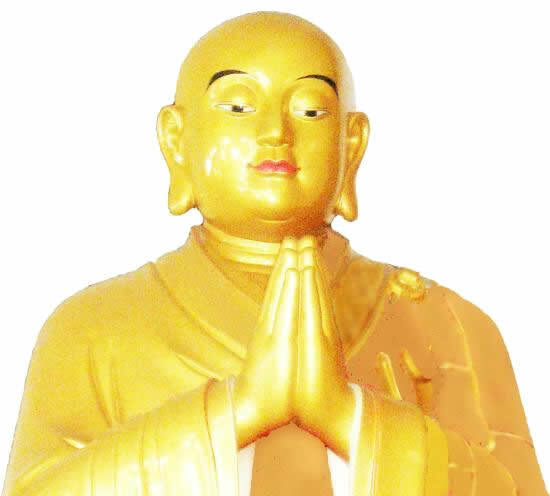 Causing me, Ananda, to quickly attain the supreme enlightenment, the Buddha Way, and sit in the Bodhimanda of the worlds of the ten directions. I will go throughout the worlds of the ten directions to teach and transform living beings and establish bodhimandas. Sitting in the bodhimanda, I will turn the dharma wheel to teach and transform living beings. Shunyata is a Sanskrit word which means “emptiness.” Should even the nature of emptiness entirely melt away. Could emptiness completely disappear? Basically, emptiness isn’t there in the first place; how could it disappear? Ananda brings up the analogy; his meaning is that emptiness can’t disappear, but if it could, even if the shunyata nature melt away, nevertheless, this vajra mind will never waver.